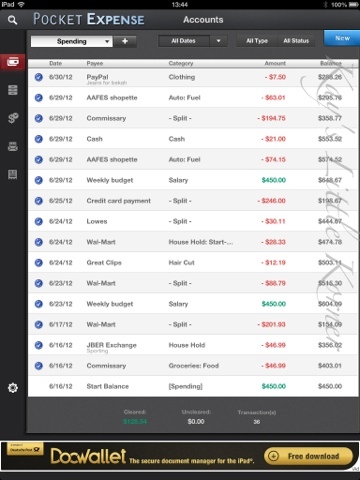 For many years we preferred Quicken for our budget tracking needs because it was easy to use and could sync with our bank accounts directly. 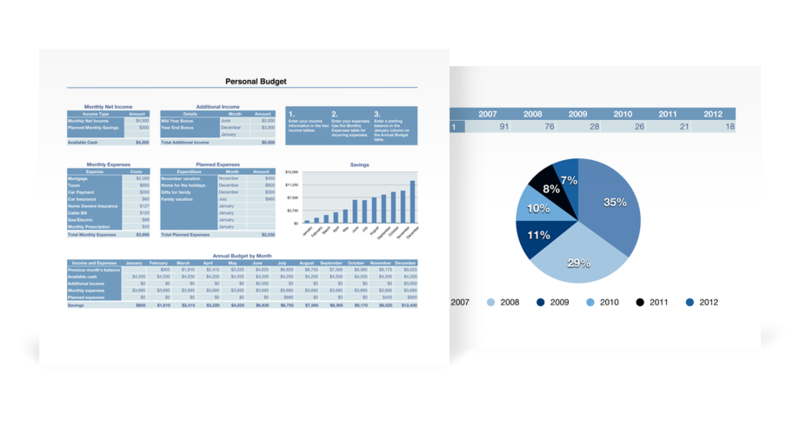 The reports were amazing and highly customizable. 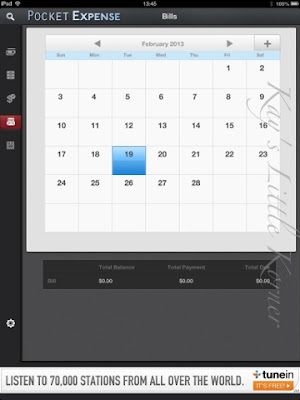 You could also track bills and due dates. Currently we use iBank because we have Macs now. This program is more expensive than Quicken and the depth of the program is not as nice as Quicken. 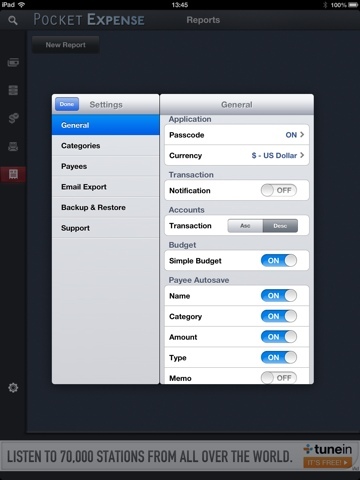 However, for basic money tracking, iBank works just fine. There is a free trial that came with hubby’s Macbook. The fun part is that he has been able to continue using the free trial by keeping to the 5 minutes allowed with the trial. It has kept our banking records, even though it is a free trial. He is just limited to a 5 minute interaction with the program. But free is free, eh? This is another option for tracking your money. 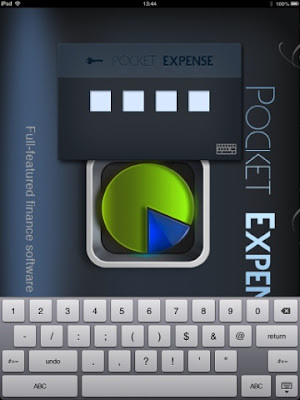 This is the Pocket Expense app from Apple. It is currently $4.99 in the iTunes store. I like this app because I can link it to my bank account directly, or not. It is password protected as you can see here. The actual ledger is self explanatory. 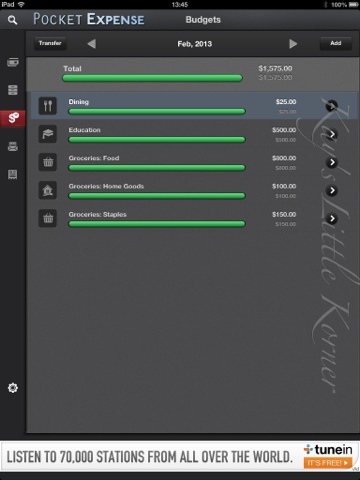 This app allows for the following of several accounts, so you can have your savings tacked as well. This is a screen shot of just one of the reports you can create on this app. As you can see from the ad at the bottom, I was testing this in the free ‘lite’ version before I purchased it. That is where the ads remain, so this would be a good beginner app for free as you train yourself to track your spending. One of the tactics we used when working out a budget was to list the income against the bills that would remain constant each month. Then we tracked the discretionary spending (cell phone bills, utilities, grocery) for a month to get a feel for what we spent in those areas. This is the budgeting section of the app. Here is where you choose what limit you will spend on your discretionary items. The calender helps you determine what day bills are due and what day you are spending money. Another great budget tactic is if you happen to be a spender, then limit yourself to shopping (online or in a real store) only 2 days a week. It sounds crazy, but this is how I kicked my eBay habit and trust me, it was a nasty habit. Let yourself go shopping, but with a monetary limit in your hand (make it cash if you have very little self control) and only let yourself do it 1-2 days a week. This will very quickly rein in the spending. This app has several settings, which is nice. 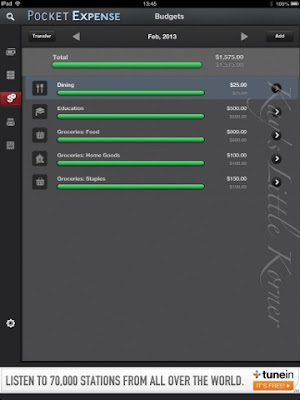 Under the category tab you can create the classification of what you are spending your money on to show up in your reports. 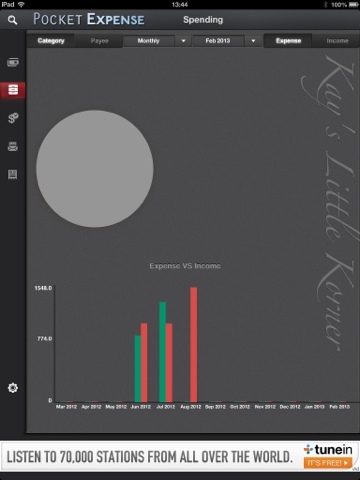 Tracking your money is a big deal when learning to be frugal. It can be a real unpleasant eye opener when you learn where the money is going. But learn this, discipline yourself to track it, and watch your savings account grow!